← Make your own Ironing Table! Birthday Cake Singer Sewing Machine! I’ve got a big birthday this weekend so I’ve got 12 friends for dinner tomorrow night and I’ve just made myself a birthday cake, a few people have said ‘but that’s all work for you’ but that’s what I enjoy, I like it! A few years ago I was given a cake decorating book for my birthday. It’s by Zoe Clark and it’s called Vintage Cakes, there are some stunning cakes in there. 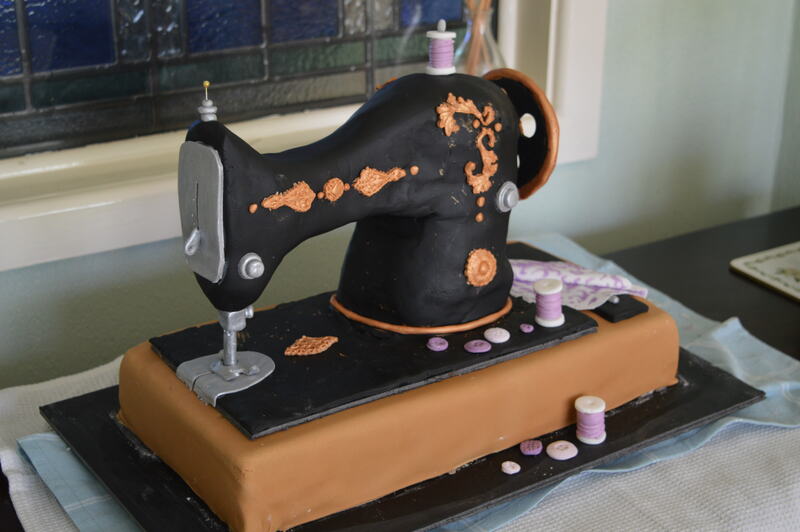 As soon as I saw the sewing machine cake I decided I would make it for my 50th birthday…and here we are!! It takes an awful lot of cake, though due to a printing error, not as much as the instructions say! The base called for an 18″ x 16″ cake, it took several days to realise it probably should read 8″ X 16″, I had already decided I was just going to use two 8″ cakes stuck together.The actual machine is made from an 11″ chocolate cake, I went through an awful lot of eggs making those, it kept my chickens busy! The cakeboards were also irregular sizes which I certainly couldn’t buy locally. I had a bit of a brainwave in Hobbycraft though, the arm of the machine is supported with foamboard, which I’d not come across before. When I looked at it, I decided to buy an A2 sheet and cut it up top make the base card, the card the sewing machine sits on as well as the arm. So far it’s worked really well, though sugar paste doesn’t stick to it so easily. It feels fairly strong though I have to confess I do have a chopping board underneath for back-up. 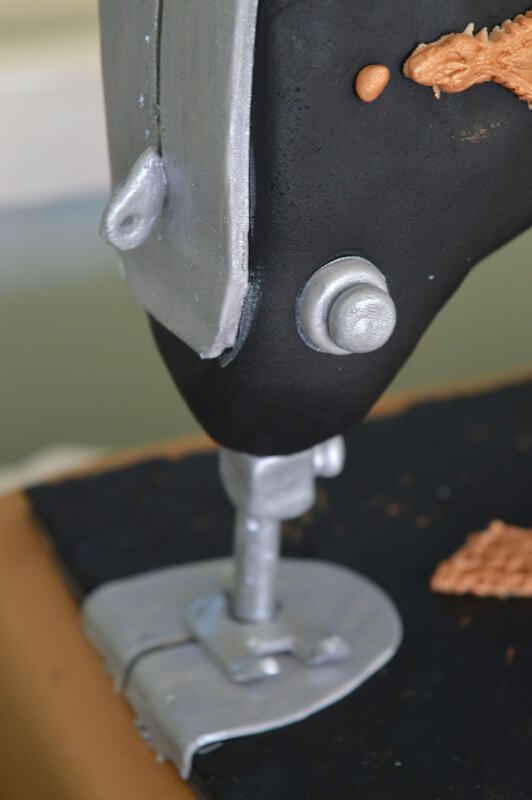 Once the basic sewing machine shape is carved the cake is covered with chocolate ganache, which I’d not used before but it does set a lot firmer than butter cream to get a nice finish. It did seem odd to keep putting the cake in the fridge to set it a bit! I think covering it in sugarpaste and trying to get a smooth finish was the hardest bit, it’s a bit like u-tube, they make it look so easy! Oh and I did have problems with the needle head as the recipe called for chocolate fondant, I used chocolate sugarpaste instead and it kept going soft and slipping down the rod! All the little bits were fiddly but fairly straight forward, all the dials and buttons etc were just different sized balls! The gold decorations were a bit of a challenge, they are done from silicone moulds dusted with gold dusting powder. The curlicue ones in particular were not easy to get out. I also found that the gold dust blew onto the black sugarpaste and didn’t come off!! In the book Zoe makes a beautiful piece of lace out of special sugarpaste, that involved buying even more kit (on top of three moulds!) so at the last minute I thought of using a stencil I’d got to make a piece of purple fabric out of flower paste. Zoe also makes the buttons with an ivory pearl sheen and cream cotton using a sugar gun. I decided to do the accessories in purple, which somehow made it mine, as purple is my favourite colour. 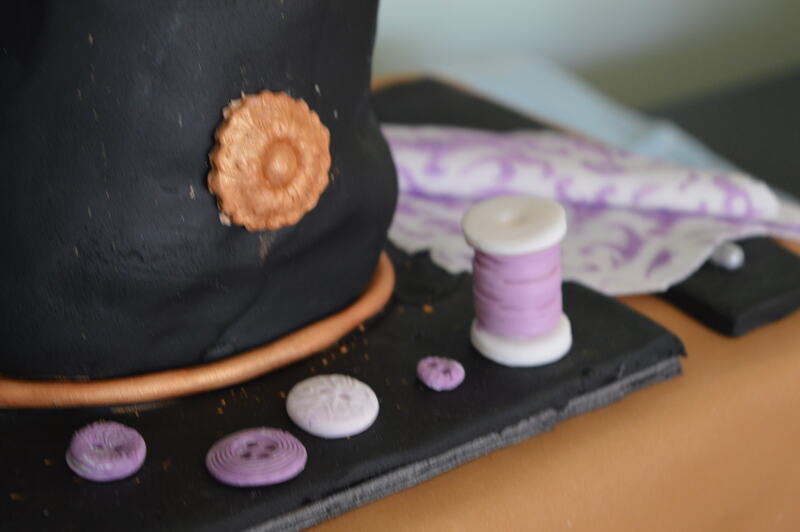 I used two shades of purple for the buttons and I just piped purple royal icing round and round the bobbins to make the thread. The wheel has been a bit troublesome in getting it to stay on, the instructions call for a little royal icing…two cocktail sticks later I think it’s going to stay on! The instructions in the book are fairly easy to follow, though I think her quantities are a bit out. I had a whole packet of black flower paste left, and the ‘ingredients’ list just said 8″ x 16″ cake covered with caramel coloured sugarpaste, so I then had to work out how much sugarpaste I would need for that too. However these are minor grumbles as I think the cake is an amazing design. 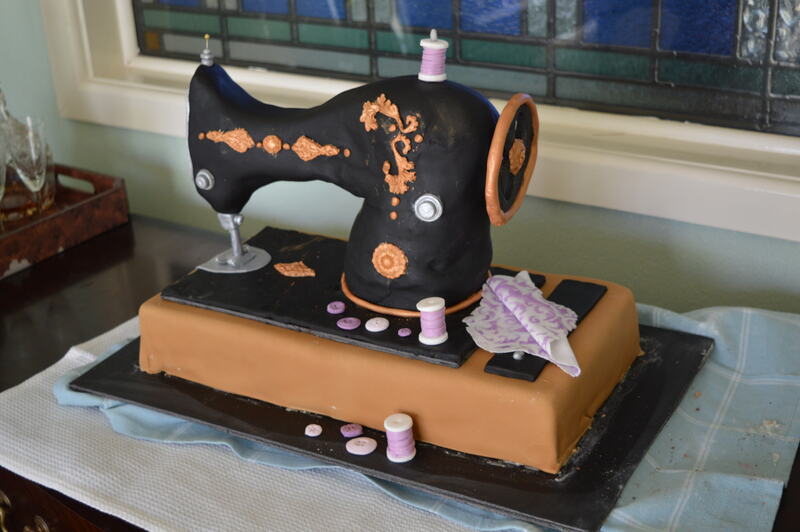 This entry was posted in Crafts, Sewing and tagged birthday cake, Sewing Machine Cake, Zoe Clarke. Bookmark the permalink. 26 Responses to Birthday Cake Singer Sewing Machine! Thank you Corrinne, I must admit I’ve never had so many likes on fb!! 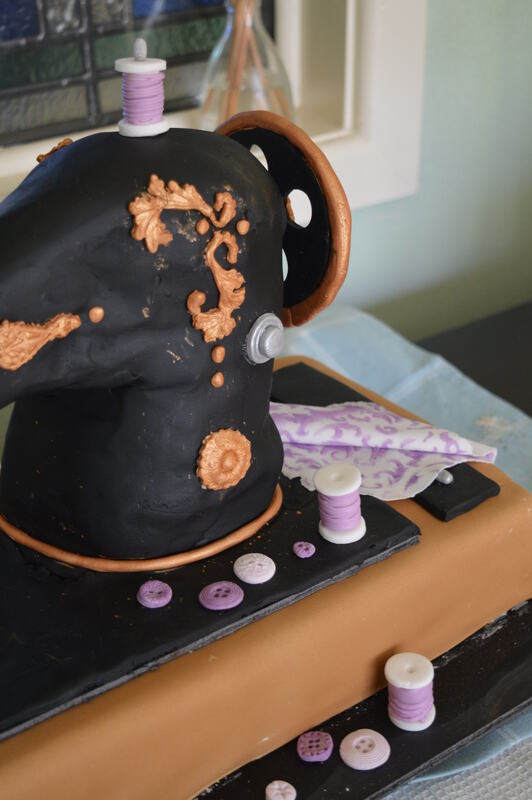 I love your sewing machine cake! Happy birthday! Happy Birthday! That is a terrific cake and probably will taste just as good. Congratulations on a delicious finished product. Thank you, it was demolished last night and tasted pretty good! Thanks Ali, I like it as a hobby, but I think I would find it too stressful as a job!! Huge congratulations – the cake is a triumph! That is so AWESOME!!!! You are so AWESOME!!!!!! Happy Birthday!!!! And congratulations on making a truly fantastic cake! Thank you Del, I had a great birthday weekend! Happy birthday 🎉🎂 this is fabulous, the cake looks really amazing. So fiddly and filled with details, I am very impressed. 😃I hope you have a wonderful day. Thanks Nathalie, I’m really pleased with it, I had a great birthday weekend! Wowza this is so impressive!!!! Enjoy your birthday!! This is phenomenal! I’m so jealous…I want one! Unfortunately It would not look anything like that if I tried to make it! Happy belated birthday! Your cake looks fabulous. That is so utterly stunning. Wow, just wow. I just told my other half I want one like that for my 40th. Awesome job!! !